The superlative batting performance of Virat Kohli (54*) proved to be the catalyst for Royal Challengers Bangalore (RCB) yet again, as he powered his side into the Indian Premier League (IPL) playoffs following a convincing six-wicket win over Delhi Daredevils (DD) in Raipur on 22 May. It was the RCB bowlers that set up the easy win by restricting Daredevils to a modest 138 for eight with leg-break bowler Yuzvendra Chahal (3/32) taking three wickets and Chris Gayle (2/11) scalping two batsmen in a single over. 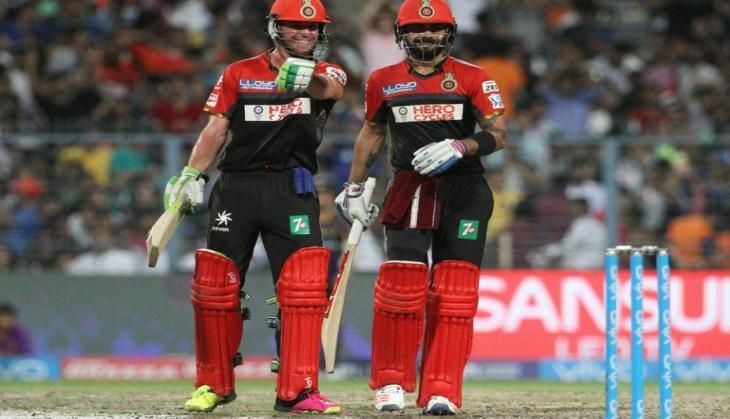 Quinton de Kock (60) hit a fighting half-century but other Daredevils batsmen struggled badly as the RCB bowlers straitjacketed them with a very disciplined effort, albeit, on a pitch that offered help to both pacers and spinners. De Kock scored 60 off 52 balls with five fours and a six while Chris Morris came up with a useful unbeaten cameo of 27 runs, late in the innings. Surprisingly, despite it being a knockout clash and a Play-offs berth at stake, many Daredevils batsmen did not show much urgency to score quickly. RCB took control of match with smart bowling and overhauled down the target with 11 balls to spare as Kohli anchored the chase with his unbeaten 54-run knock. His well-calculated innings came off 45 balls and had six shots to the fence. RCB lost Chris Gayle (1) and AB de Villiers (6) early in the innings but inspirational skipper Kohli ensured that his side capitalise on the good work done by the bowlers with his responsible batting. RCB survived fiery spells from Morris and rival captain Zaheer Khan, who both tested Kohli and KL Rahul with their accuracy and speed. Rahul played a gem of a knock (38 off 23) as his quick scoring took pressure off Kohli. They added 66 runs for the third wicket before Rahul found his stumps disturbed when the ball found a way to hit the timber after playing a defensive shot off Carlos Brathwaite. Shane Watson joined Kohli, enjoyed two lives in the 14th over, but could not cash in on as he holed out to Sam Billings off Negi in the 15th over. At that stage, RCB needed only 28 runs off five overs. Kohli steered the side to win in company of Stuart Binny, who scored 16 off 11 balls. Kohli ran hard and desisted from playing extravagant shots. With their fourth straight victory, RCB finished second in the table and will clash with table toppers Gujarat Lions in the first Qualifier on Tuesday in Bangalore. Third-placed Sunrisers Hyderabad face Kolkata Knight Riders in the Eliminator on Wednesday in New Delhi. Daredevils and Mumbai Indians, who were also in Play-offs race till today's matches, were eliminated. Earlier, Daredevils made a sedate start and lost young Rishabh Pant (1) early when he was caught behind off Sreenath Aravind on a delivery that took off after being pitched. Another young gun Karun Nair (11) made an early exit but De Kock kept the innings together and paced his own knock well under the conditions. At half-way stage, they were 75 for three with Sanju Samson becoming victim of Chahal. The ball turned sharply, Samson tried to guide it to the third man but could not connect. Wicket-keeper KL Rahul jumped in the air, claiming the edge, and the umpire raised his finger. Sam Billings too departed when his cut off Chris Jordan was taken brilliantly in the air by a diving Chris Gayle. It could have been worse for Daredevils had Aravind not dropped Pawan Negi, who had not even opened his account, in the last ball of the same over. De Kock completed his half-century with a single in the 14th over, bowled by Aravind, who again dropped Negi but it was a tough chance in his follow through. Skipper Virat Kohli marshalled his troops well, using seven bowlers by the 15th over. His slow and medium pacers did an exceedingly good job. Gayle sent back Negi (6) and Carlos Brathwaite (1) in space of four balls. It was now left to De Kock and Morris to lift the Dardevils innings but the South African southpaw was dismissed by Chahal at the start of the 17th over.